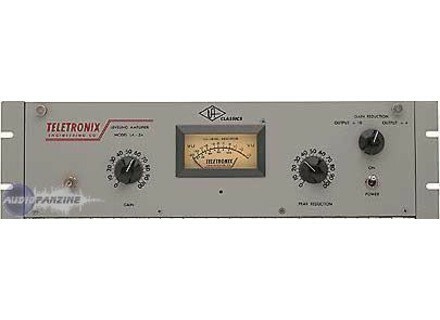 Teletronix LA2-A Plug-in, Software compressor from Universal Audio in the UAD Plug-In series. Viguier's review (This content has been automatically translated from French)" Very very good, but not all styles ..."
Pentium 4 PC with 3 gigs of RAM, card Soundscape Mixpander 9 (a monster too). For instance the number of card, look at the new site of Universal Audio (in addition, it depends on the type of card being used ...). STABLE is used on the SSL V5.5 and V6 Sounscape, no worries! Not a single crash (and I use this software for 3-4 years, NEVER any crash ...). That made 2 or 3 months that I use, I have some compressor Harware (AU 1176, Summit TLA100, Neve 33609, Joemeek VC1Qcs, dbx 160X, ...) and quite of virtual (especially the AU: 1176, LA3A, Fairchild, ...).